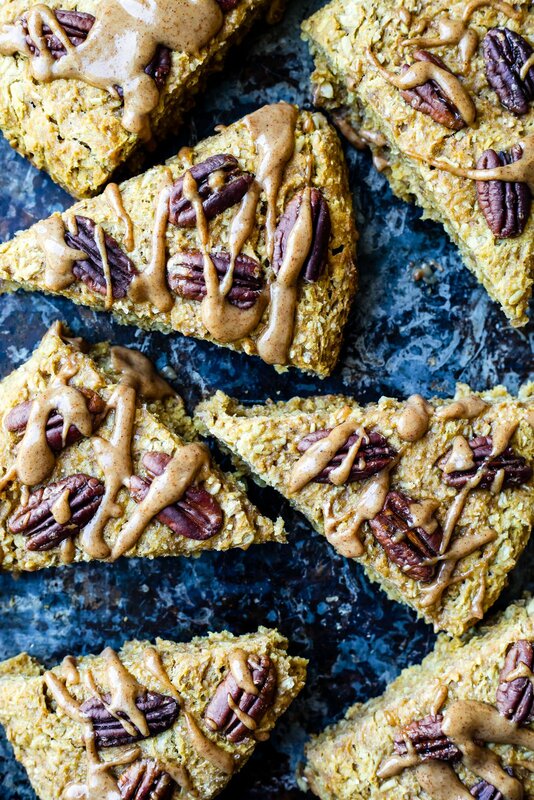 Fall-inspired vegan pumpkin oatmeal scones with hints of maple, pecan and pumpkin spice in every bite! Made with hearty Coach’s Oats for a wholesome, filling snack to pair with your cup of coffee. Many apologies over here because I haven’t made you a scone recipe since 2014. Another apology is due to the fact that we’re already mid-way through September and this just happens to be my first pumpkin recipe of the season. SAYYYY WHAAAA? 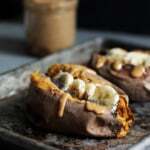 Usually I start posting pumpkin recipes in late August or early September, but over the past few years pumpkin craze has been a little insane in the grocery store so I decided to hold off. Sorry, but I do not want pumpkin pringles, pumpkin frosting, pumpkin coffee creamer or pumpkin spice infused hair products. Wanna know what I do crave in the fall though? The regular stuff. A slice of homemade warm spiced pumpkin bread, pumpkin pie, fluffy pumpkin cheesecake with a gingersnap crust or if I’m lucky, pumpkin butter (usually from trader joe’s) slathered on my toast in the morning. 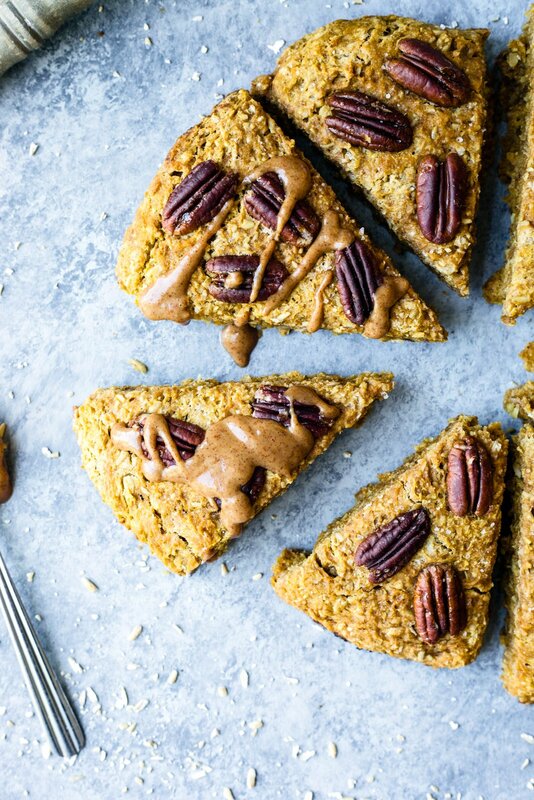 And now: these VEGAN maple pecan pumpkin oatmeal scones with a little pecan butter glaze. So get ready for a cozy week ahead, with pumpkin scones and a big cup of coffee. We’re ready to start fall the right way (without the weird pumpkin pringles). These scones were made from some fun experimenting in the kitchen. If you’ve never made scones before, then get ready because they are easier than you think. To make the base of these scones, I used whole wheat pastry flour and Coach’s Oats because I knew I wanted to make these with whole grains so that they’d be perfect for breakfast. If you haven’t heard of Coach’s Oats before, then it’s your lucky day because these oats are INSANELY GOOD. I hate to call them oats because technically they are groats. Groats are an oat kernel with the hull removed. Coach’s Oats are specially prepared by toasting the groats to bring out the natural sugars to the surface of the oat, then cracked into small pieces. This patented Cracked n’ Toasted™ process means that Coach’s Oats are never mushy, always naturally delicious and cook in just 3 to 5 minutes on a stove top or in the microwave. You can read more about the difference in their oats right here. These scones are also naturally sweetened with maple syrup and a hint of molasses (trust me it makes an amazing difference). After the scones bake, they are topped with a pecan butter glaze (only if you’d like). 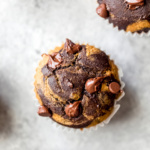 I think they’re perfect for snacking, slathering with pumpkin butter, baking up for a brunch or enjoying with a big cup of coffee on the weekend. I hope you love these hearty, fluffy pumpkin scones. If you make them, be sure to let me know by leaving a comment below, or tagging #ambitiouskitchen on Instagram! 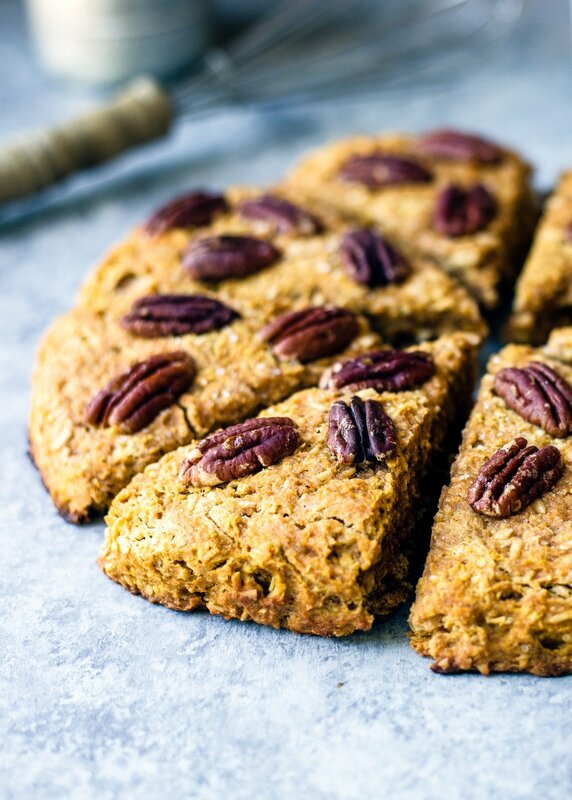 Fall-inspired vegan scones with hints of maple, pecan and pumpkin spice in every bite! 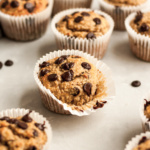 Made with hearty Coach's Oats for a wholesome, filling snack to pair with your cup of coffee. Preheat oven to 425 degrees F. Line a large baking sheet with parchment paper. Set aside. 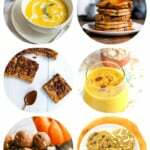 In a large bowl, mix together the pumpkin puree, maple syrup, molasses, almond milk, vanilla extract and apple cider vinegar. Set aside. Add flour, baking powder, cinnamon, ginger, nutmeg, allspice, cloves and salt to the bowl of a food processor. Next add in butter pieces and pulse a few times until mixture resembles coarse crumbs. Add flour mixture to pumpkin mixture, along with the Coach's oats. Stir until just moist; the dough will be very soft. Place dough on the prepared baking sheet lined with parchment paper. Pat the dough into an 8 inch circle using floured hands. Cut into 8 triangles, but don’t cut all the way through the dough. Add 3 raw pecans to each scone triangle. Bake for 20-25 minutes or until slightly golden. Once scones are done baking, mix together the glaze, if using: Add pecan butter, maple syrup, salt, and warm water to a small bowl. Mix together until smooth and creamy like a glaze. Drizzle over the scones and enjoy! Serves 8. 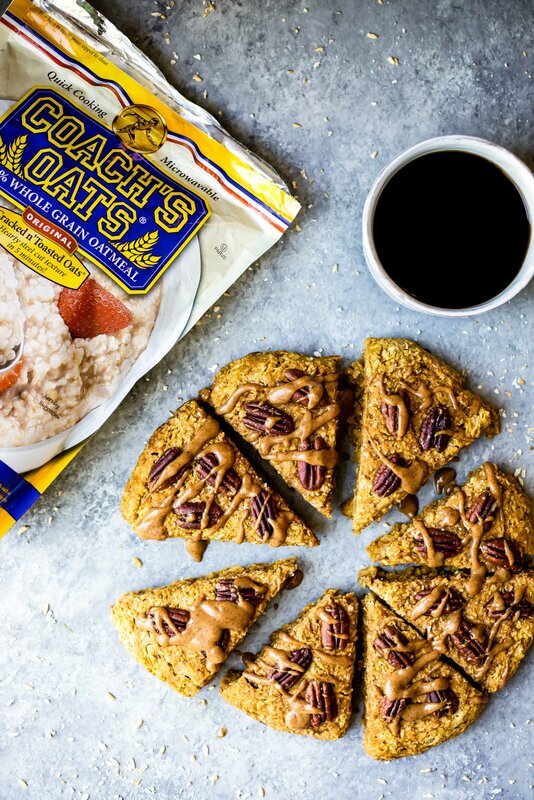 This recipe is in partnership with Coach’s Oats, a brand I trust. Thanks for supporting AK and the brands that help make this site possible! 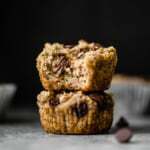 21 Responses to "Vegan Maple Pecan Pumpkin Oatmeal Scones"
But how can you not want pumpkin-infused hair products?! 😉 I feel you though, I’m over here trying to hold on to the remnants of summer. This recipe looks BOMB, and I will definitely be making it as soon as I get home for break. Right?! I’m between embracing fall and holding onto summer 🙂 Hope you get the chance to make these!! Oh. Em. Gee. These scones look INCREDIBLE. Adding them to my fall baking list ASAP. YES I hope you love them! I’m with you on starting fall the right way and not with things that pumpkin has no business being part of!! Baked goods, yes. Candles, yes. Body care products, no. I for one do not want to smell like food. Hmmmm… need to make these GF. I’m wondering about subbing buckwheat flour for whole wheat. Do you think the buckwheat flavor would be too strong here? OR I could do a buckwheat/coconut flour combo to tone it down? Totally agree! I haven’t tried this recipe yet with a GF flour, as it will probably make the scones pretty dense. Let me know if you do try buckwheat! What is your recommendation for gluten free substitutions? What do you recommend subbing for the Coach’s Oats if we cannot find them? You could try using regular rolled oats, or head to their site here to get them! Yummy! I was never the biggest fan of scones, but they do look delicious! I’m stoked that pumpkin season is here. It’s wonderful! I have made these three times. Absolutely delicious. I always tweek recipes to make them healthier. I substituted applesauce for the butter, which makes them dense, but guilt free. I also toasted the pecans and mixed them in. Added raisins, dates, Chia seeds, pumpkin seeds. You can also use ground flax instead of egg. Yum, yum, yum!!! Wow – gonna make this ASAP! Sounds delish. I discovered Coach’s oats on a trip to California a few years ago and pick up 2 big bags every time we visit. Not sure if they are available in Canada. Thanks! Love them! 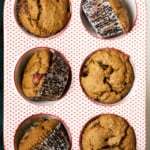 So great for baking + breakfast.